Posted December 6, 2013 by benji & filed under Java. Today someone asked how to verify that only your stubbed interactions occur, and no others (when using Mockito). I have heard this asked this quite often, especially by people used to JMock where mocks are strict by default. I’d be interested in knowing if there’s an out of the box way of doing this. The normal way to do this is to verify all the calls you expect to happen and then verify no more interactions occur. //Why do we need to do this? If you omit the two verify lines then the test will fail, despite us stubbing quack with “when”. It would be nice to remove this duplication. Now, at this point someone will probably point out that often verifyNoMoreInteractions, and even multiple verifications in a test can be a sign of an inflexible test that is easy to break with minor implementation changes. However, sometimes you really do want to assert that a collaborator is only used in a specific way. You might also temporarily want the mocks to be more vocal about how they are used, in order to help diagnose why a test is failing. So how can we make this better with Mockito? Mockito provides an Answer. This is called when you invoke a method on a mock. Answer is an interface that Mockito provides to allow you to specify the response to a method invocation on a Mock. It gives a bit more power than simply returning a value. For instance you can use it to capture method parameters passed to stubbed method calls for later assertions. Answer is useful for solving this problem because we can specify a default Answer that a mock will use whenever a method invocation has not been stubbed. In our case we want the test to fail, so we can simply throw an Exception with some information about the unexpected invocation. Here the first test only performs stubbed operations on the mock, so passes. The second test calls an unstubbed method and an Exception is thrown. How is it implemented? First we create a static method to create ourselves a mock. The second argument here is the default answer, Mockito will invoke the “answer” method on this handler for every unstubbed invocation. Finally, we provide a static method for toggling the strictness after our stubbings, this pulls out the default Answer from the mock using a utility that Mockito provides. I don’t believe this can deasily work with @Mock annotation based mock creation. You can pass in a different answer by doing @Mock(answer=Answers.RETURNS_SMART_NULLS), but this is limited to the values on the Answers enum. See the implementation and sample tests on github. Posted December 4, 2013 by benji & filed under Java. As with try-as-expression, there are many other language features we can simulate with Lambdas. Where x is “casted” to Duck within the block. 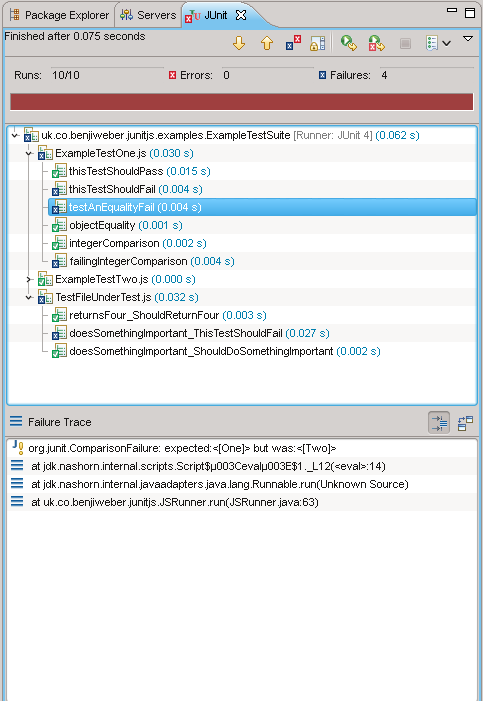 I previously blogged how to simulate this in older Java using dynamic proxies. Now in Java 8 you can do it in a slightly less terrible way, and also make it an expression at the same time. More examples and implementation on github. Posted November 29, 2013 by benji & filed under Java. I’ve been familiarising myself with the new Java 8 language features. It’s great how much easier it is to work around language limitations now that we have lambdas. One annoyance with Java is that try blocks cannot be used as expressions. We can do it with “if” conditionals using the ternary operator. But you cannot do the equivalent with a try block. However, it’s fairly easy now that we have lambdas. Posted February 3, 2013 by benji & filed under XP. There was a thread about pair programming on the London Java Community mailing list last week. I tried to contribute to the discussion there, but the mailing list doesn’t receive my replies. So I’ll post my thoughts here instead. I have been pair programming most days in an XP team for the past 3 years. These are some of my experiences/thoughts. Obviously I enjoy pairing or I wouldn’t still be doing it, so I am biased. This is all entirely anecdotal (based on my experience). A common “alternative” to pairing is code reviews. One of the reasons I like pairing is that it fixes the problems I have experienced with code reviews. A developer may work on a change for a day or two before submitting code for a review. This means they have invested a considerable amount of time and effort into a particular approach, which makes it hard not to take criticism personally. It can also waste a lot of time re-doing changes, or worse – leads to the temptation to let design issues slip through the code review because going back and re-doing the work would be too costly. Sometimes only a diff is reviewed. This seems to promote nitpicking about formatting, naming conventions, guard clauses vs indentation and so on. These issues may be important, but I feel they’re less so than the affect of the changes on the design of the system as a whole. Does the changeset introduce more complexity into the model, or simplify it? Does it provide more insight into the model that suggests any significant refactorings? I find that pairing – when implemented well, can avoid these problems. The feedback loop couldn’t be any tighter, as your pair is right there with you as you write the code. The navigator is free to consider the bigger picture affect of the changes. Programming can be isolating. You sit in a room all day staring at a computer screen. With pair programming you get to write code all day and still talk to people at the same time. It can often seem slower than working alone, but in my experience timing tasks it actually ends up taking less time when pairing. Its easy to underestimate how long you can be blocked on small problems when working alone which doesn’t happen as often when pairing. Pairing also keeps you focused and stops you getting distracted by IRC or news sites. A lot of defects get noticed by the navigator that would have slipped through to a later stage. The temptation to take shortcuts or not bother with a refactoring is reduced because you’re immediately accountable to your pair. The caveat to this is that conceptual purity can be reduced by rotation. No-one likes to sit and watch while someone else types for hours on end. If you hog the keyboard, then your pair may lose concentration or not follow what is going on. Swapping roles helps to remain focused, and provides a change. It’s sometimes easier to swap roles when the navigator has an idea they want to explore or a suggestion that’s quicker to communicate through code than verbally. TDD provides a natural rhythm that helps pairing. If you find that one person is driving too much then one way of restoring the natural rhythm is for one half of the pair to write a test, and the other to implement, and swap again for each refactoring stage. Its best to be flexible, not stick to this rigidly. Sometimes it makes sense to write two or three testcases at once rather than limiting yourself to one, while you’re discussing possible states/inputs. TDD also helps to do just enough generalisation. When working in a pair it can be easy to talk yourself into doing unnecessary and unhelpful work to make an implementation ever more general and abstract. I find that often, when someone suggests a more general interface to enable potential future re-use, it turns out to never be used again. Abstraction for the sake of abstraction can also make the intent of the code less clear. TDD’s Red/Green/Refactor stages help to refactor for immediately valuable re-use within the existing codebase, but the act of writing tests for features you don’t actually need helps you to consider carefully whether it really is worthwhile. You need to be constantly talking about what you’re doing. Questioning and validating your approach, considering corner cases etc. Swapping pairing partners regularly helps to share the knowledge of how things are implemented around the team. Rotation also often provides further incentive to improve the implementation, as a fresh set of eyes will see new issues, that the pair had been blind to. It also means you’re less likely to get fed up with working so closely with the same person for an extended period of time. On more complex and or longer tasks, it can be useful for one person to remain working on the same task for 2 or 3 days, to ensure there is some continuity despite the rotation. Pairing enforces shared ownership as there’s never just one person who has worked on a particular feature. In order to rotate pairing partners, everyone needs to be free to work on any part of the codebase, regardless of who it was written by. Pairing works well to ensure that a feature is implemented to a high standard, when both people have a reasonable idea how to go about implementing it. It is not good for exploring ways to implement something that is unfamiliar. It’s easier to find a solution to an unknown problem when working alone, where you can concentrate intensely and have uninterrupted thought. This does mean you need to break down tasks into an initial spike step, and a second implementation step. It’s important to have time when not pairing to allow for innovation and explore unconstrained ideas. Otherwise you can end up with groupthink, and constantly play it safe, using techniques that everyone has used before, and know work. Having two people work on making copy changes is probably a waste of resources. Deciding where to draw the line is tricky. I think if the change needs more than a couple of tests it is a good idea to pair on it. There are lots of contexts in which pairing is simply not possible. e.g. Distributed teams in different timezones. Open source projects with sporadic contribution from a large number of people. Pairing is hard work, it’s certainly not for everyone. You have to be alert for long periods of time. You can’t drift off or distract yourself in the middle of a pairing session in the same way that you would when working alone. It can often feel like progress is slower than it would be when working alone. If you’re not driving, it can be frustrating seeing people failing to use keyboard shortcuts or type slowly. If you are driving then you have to slow yourself down to constantly discuss what you’re doing and why. This is more rotation than pairing itself – when one person has implemented a feature, you can often see a single vision for that feature when reading the code. Some of this seems to be lost with regular rotation. Just like a novel would be slightly odd if each chapter was written by a different author. It can be enjoyable having freedom to divert and work on things you feel important that aren’t really relevant to the task at hand. This tends to happen less when pairing because you’d both have to see the diversion as important. This comes up in any discussion on pairing. Having two developers working on a problem doubles the cost. Wouldn’t they have to work at double the speed in order for pairing to make sense? Most of the cost of a feature occurs after it has been developed. In support/maintenance/resistance to future change etc. Any improvements you can make at the point of development to reduce defects, and make it easier to maintain the software in the future should yield big benefits in the future. Then there’s other benefits to the team. It takes less time for new developers to come up to speed with the codebase, and technologies in use, when they are pairing with developers who already know what they are doing. Implementation details of any part of the system are known by at least 2 people, even if they have failed to communicate them to the rest of the team. This reduces the team’s bus factor, and makes it less painful when a team member decides to move on. Shared ownership is unavoidable. There’s no single person to blame for any problem. Failures are team failures and fixing things is everyone’s responsibility. This means the team gets to focus on how to stop things going wrong in the future. I enjoy pairing because it gives the tightest feedback loop, and it’s social. Not all tasks are suitable for pairing. Posted January 27, 2013 by benji & filed under Java. 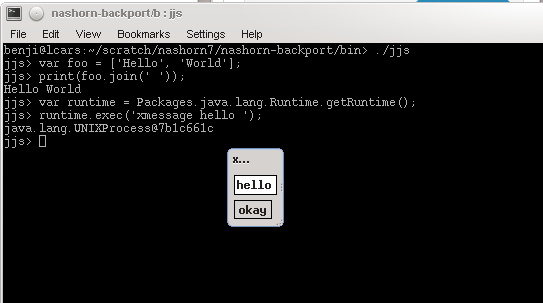 Nashorn also comes with an interactive shell “jjs”, which is great for trying things out quickly. Posted by benji & filed under Java. Here’s what a test file looks like. // Load Rhino if no nashorn. ScriptEngineManager factory = new ScriptEngineManager(); ScriptEngine nashorn = factory.getEngineByName("nashorn"); if (nashorn != null) return nashorn; // Load Rhino if no nashorn. You can quickly implement stubbing that also integrates with your Java JUnit tools. Here’s the test code from the above screenshot. To implement the stub you can use __noSuchMethod__ to capture interactions and store them for later assertions. The steam linux beta is now open to everyone. I just installed it on my openSUSE PC. Here’s how. Alien is a tool that can convert debian packages to RPMs. The SDL_AUDIODRIVER=alsa was needed for me because I uninstalled pulseaudio because I like being able to play multiple audio streams at the same time. I have added support for searching by package names only. This was one of the most requested features. I would like to make the normal search “just work” as much as possible and rank relevant search results highly. However, there do seem to be some good use cases for only searching package names. You can do so by prefixing a search term with either name: to restrict your search to package names or exact: to find only packages that exactly match the specified name. I’ve added a tips page to document these hidden features. Please do keep your suggestions and bug reports coming via email. Posted December 1, 2012 by benji & filed under c#, Java. Someone on IRC was asking whether it was possible to do catch multiple types of exceptions at the same time in c#. Here the catch block catches either an ExceptionA or an ExceptionB. This can be useful if you want to handle several exceptions in the same way. We create a method called Try and pass it an Action. We then chain a call to a Catch method which we pass the Exceptions we want to catch as Type arguments. As you can see we can vary the number of type arguments. This is something you can’t do in Java partly due to type erasure. and the Catch method has overloads for any number of exceptions you want to support. We can restrict the type arguments to only Exception types by using the where clause. I had to use an abstract class instead of lambdas as Java has no lambdas. I also had to create a new class for each number of type arguments I wanted because you can’t overload with variable numbers of type arguments. I also had to use Gafter’s gadget to access the types of the Exceptions to catch. Here’s the full code listing. Fixed an indexing bug that meant searches for some exact-match filenames returned no results. This will require re-indexing all repositories at some point. Here’s a search that wasn’t working and is now fixed Thanks cb400f. Now that it has had some testing I’ll be making sure that all the remaining OBS repositories are indexed. I’ll also perform a complete re-index of all repositories to benefit from the indexing bugfixes.